Pedestrian protection | What Car? A series of tests are carried out at 25mph, using adult and child pedestrian dummies. The areas where a leg, upper leg, child's head and adult's head would impact with the car are then rated as fair, weak or poor. The highest star rating a car can receive in this test is four. Protection can be improved by using pedestrian-friendly bumpers that deform on impact, or that are fitted lower down so they do not hit a pedestrian's knee. Larger bumpers, which spread the force of an impact over a larger area, are also important. The leading edge of a bonnet can be made safer by removing any unnecessarily stiff structures that will damage a pedestrian's leg in an impact. 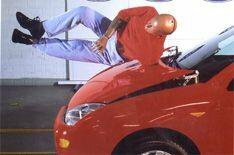 Pedestrians' heads can also be protected if the upper part of the bonnet can absorb some of the impact by deforming, and there are no stiff structures beneath the bonnet. Pop-up bonnets, which spring up when an impact is sensed, provide extra pedestrian protection, because they increase the area the bonnet has to absorb impact.